Joshua McAdams is a track and field athlete who competes in the 3,000-meter steeplechase, the event he competed in during the 2008 Olympic Games in Beijing. He placed third in the Olympic trials and ninth at the Olympics. He is a member of The Church of Jesus Christ of Latter-day Saints. 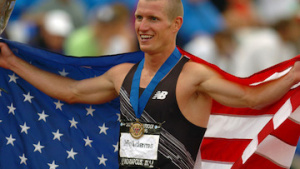 McAdams was born on March 26, 1980, in Atlanta, Georgia, and was a four-time Ohio School Athletic Association (OHSAA) state placer in track and cross country. He also competed in wrestling and was a three-time OHSAA state placer in that event. Prior to his full-time mission to Thailand, he attended Belmont University. In year he transferred to Brigham Young University. While at BYU, he competed on the track team (as a walk-on, or non-scholarship student) and his coach, Ed Eyestone, suggested he try steeplechase. In 2006 he won the NCAA Championships in the 3,000-meter steeplechase and in 2007 the USA Championships and Pan American games. He won sponsorship from Adidas and earned his degree in microbiology. After the Olympics, he graduated from the Southern College of Optometry in 2012 with a Doctor of Optometry (OD) degree. He practices in Arizona, where he lives with his wife and two children. He also works with youth runners. This page was last edited on 24 April 2017, at 16:09.